I often receive comments from people intrigued by the intricate details of my beadwoven pieces. But what wows me are designers who take wire and beads and string them and wrap them into striking works of art. Sleek and modern, rustic and tribal, vintage, exotic, iconic - how do they do that? To help answer that question, I signed up for Deryn Mentock’s online design class, the Alchemy of Objects. Last week Deryn challenged us to create an asymmetrical piece. 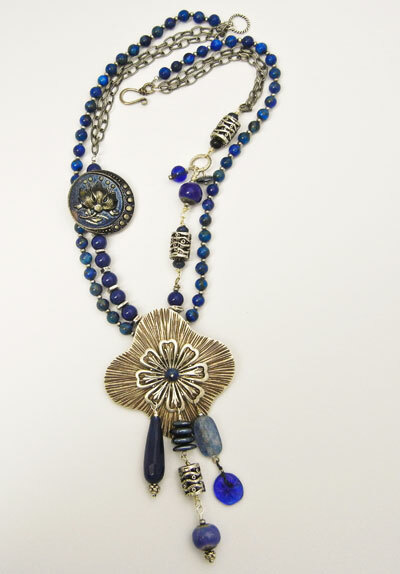 I started with a vintage button and a strand of lapis rounds, then pulled together all the metal components and coordinating strands I could find. (When the situation calls for more than seed beads, my stash gets a little thin.) 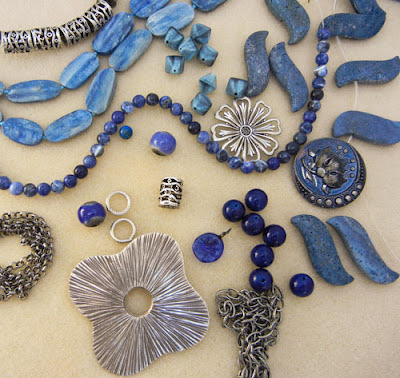 I did allow myself a single tube of size 8 seed beads in zinc, which contrasted nicely with the shine and the natural gold flecks in the lapis. The class videos gave glimpses into the creative decisions that go into Deryn’s own enviable designs and were rich in examples for achieving both visual and physical balance. I chose monochromatic with this first attempt, and am looking forward to challenging myself with more color for next week’s adventure: Texture. 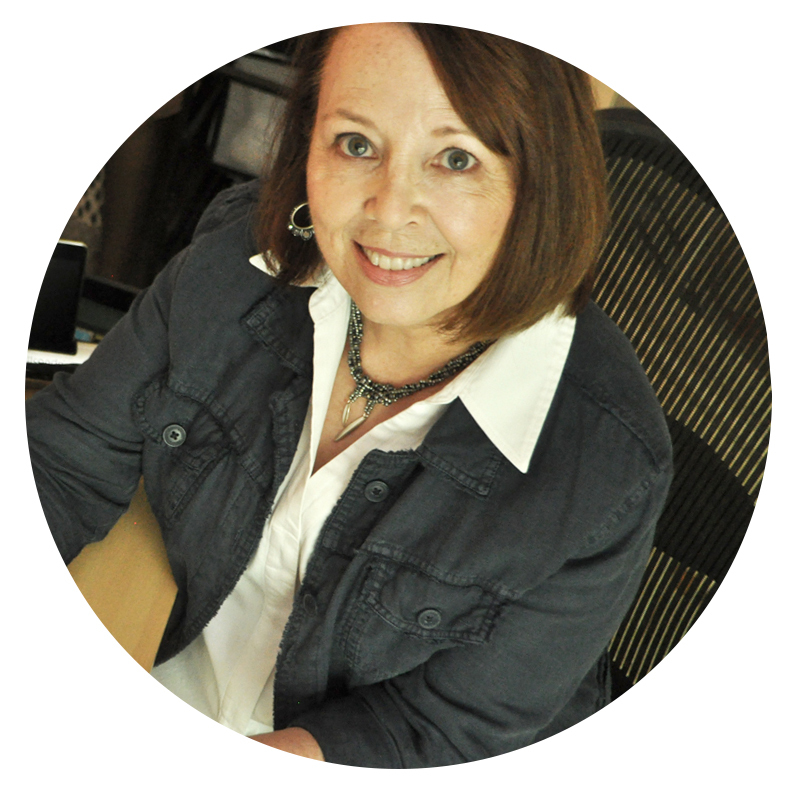 Sign-ups for Deryn’s class are open until mid-October, so head over to her website if you're looking for an inspiring, nuts-and-bolts design class. This is beautiful.. love it. Oh, this is lovely! Can't wait to see where these classes take you and your imagination! Oh wow Karin, your necklace is beautiful. Silver and blue a match made in heaven. Deryn is a wonderful teacher! I've taken 2 of her online classes and am heading to my first art retreat next weekend - I'll be taking 2 classes with her in person! Can't wait! You did a fabulous job with your first asymetrical piece, just lovely! That's a beautiful necklace, and I love the focal! I can easily see you incorporating these new techniques into your pieces! What a beautiful and unique design! I really like the monochromatic color scheme. There are a lot of interesting design elements in this piece and they all work wonderful together as a whole! Very nice! So glad to be participating in Flying Lessons with so many remarkable and talented women!